Khao Tom Mad is a tradition recipe for Thai food, Thai people who believe in Buddhism. They’ll cook Khao tom mad and go to temple in the Buddhist holy day. So, this recipe is popular because taste is mild and a tiny sweet from banana and coconut milk. 5/4 cups (300 g) glutinous rice, soaked in water for 1 hout and drained. Mix the soaked, drained glutinous rice with coconut milk, sugar and salt in a nonstick saucepan and bring to a boil over medium heat. Reduce heat to low and simmer, stirring constantly until the rice is cookec and all the coconut milk absorbed. This should take about 15 minutes. Leave to cool. 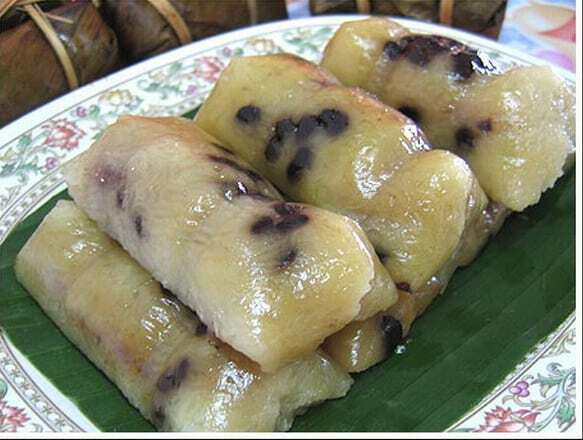 Take a pice of banana leaf and put a tablespoon of the rice and a teaspoon of red bean on it. Place a slice of banana on top, cover with more rice and red beans, then fold up the banana leaf and secure with a toothpick. Repeat until all banana are used up. Stream for all banana are set aside to cool.